Oh, and Happy Thanksgiving! See you next week! i loved it !! 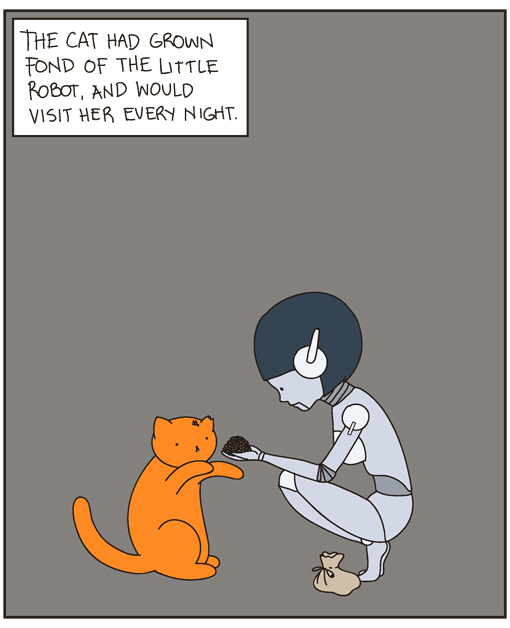 poor little robot :( but she has a kitty friend! Squee! Oh the kitties are full of wisdom and love. 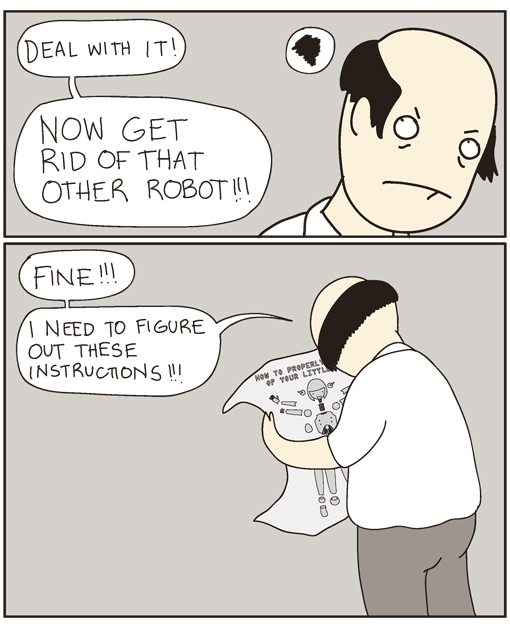 Silly humans! Thank you for this great update! Isaac Asimov would be proud! 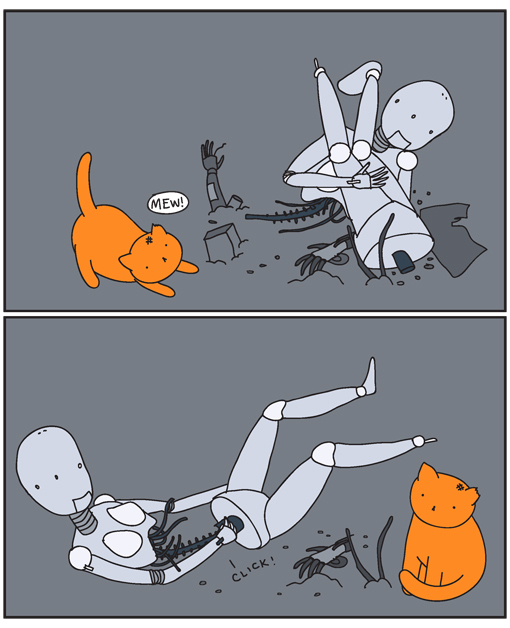 I, robot...and kitty :D LOVE IT! Owwwnnnn!!! That's really cute!! Almost made me cry! You're super, thanks for that! Love love love the last line! I came for a laugh, but I got sad instead... beautiful comic though! pls make a happy sequel, pls pls pls!!! Beautifully done. Not only should there be a sequel, but this would be a great regular comic! ...and the world they build would be one that is based not on consumption but on compassion and respect for all beings. 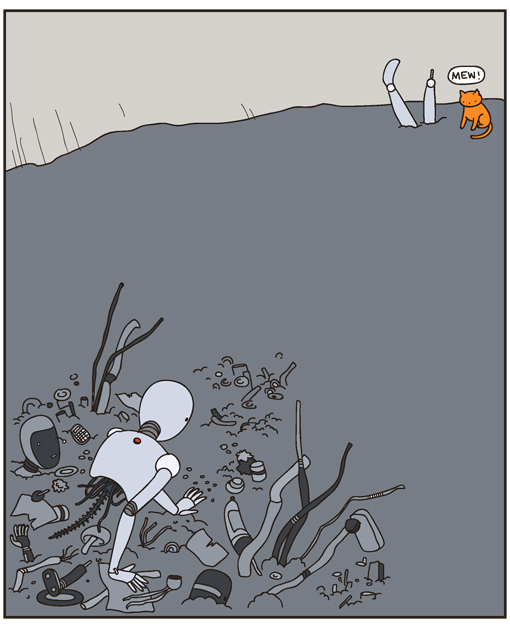 "And with the help of her kitty friend, she builds an army made of discarded robot scraps and they take over the world. 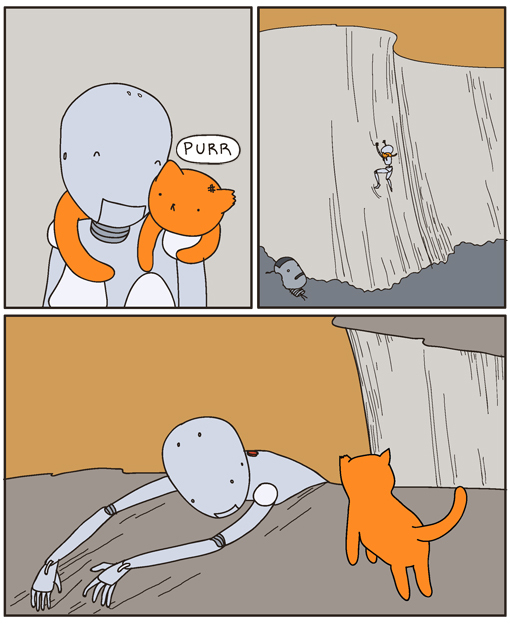 But this will probably be another comic :)"
So sad for little robot; but as is ever true, it takes a cat to see the heart, soul, and character of a being. Terrific. Happy Thanksgiving, Yasmine. Your comic really touched me. I agree with the person above who said the morale of the story is to love a cat. You never know how that act will change the world and yourself. Perfect. Love, betrayal and redemption. 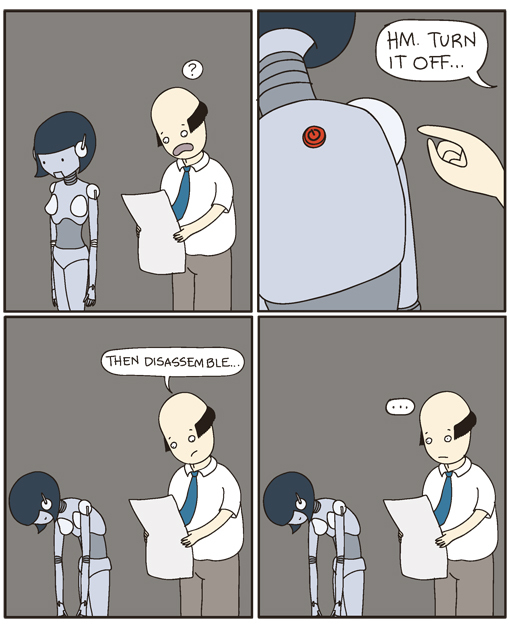 Poor little robot! Your long comics are always very heartwarming. It's always fun to read them! This is soo cute! Thank you and happy thanksgiving! Longtime reader, first time commenting... this was so beautiful I got misty :) Perfect metaphor for how our kitty friends can help us put ourselves back together. Thanks for your wonderful comics! 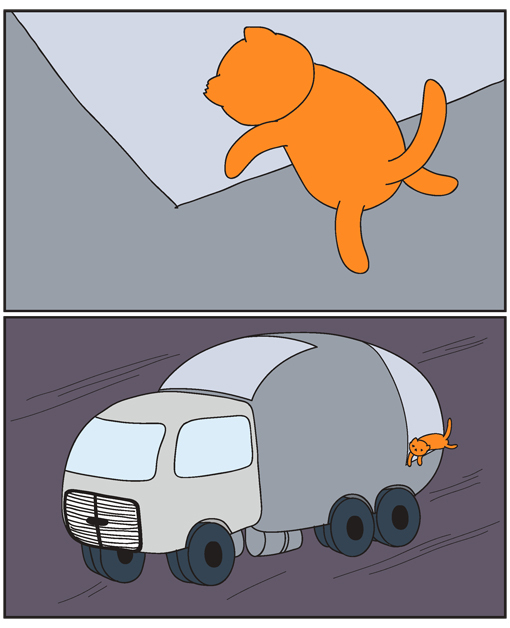 PS Love the aerial image of the truck speeding away with the cat clinging to it. With a kitty friend everything is always alright!! This is so sad... I have tears in my eyes while reading! Ohh can't wait to see this story continue! Love it so far! so cute! I loved it! So adorable. Kitties make the best of friends. 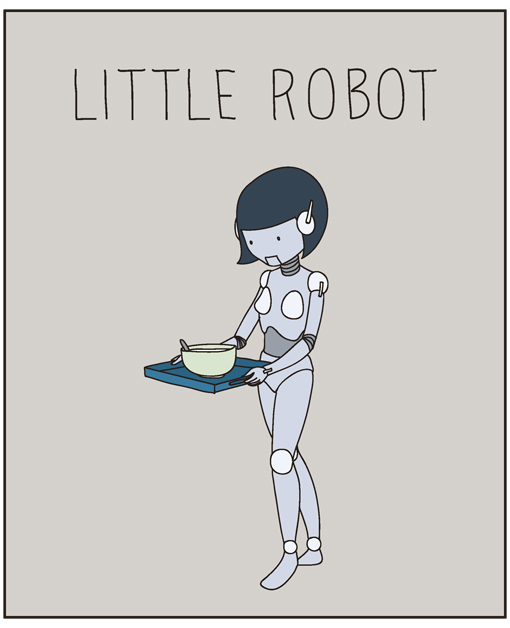 The story of the little robot reminded me of my divorce.Thanks, Happy Thanksgiving Day. Awww...I love this comic so much! Wow! That could be a major film right there. 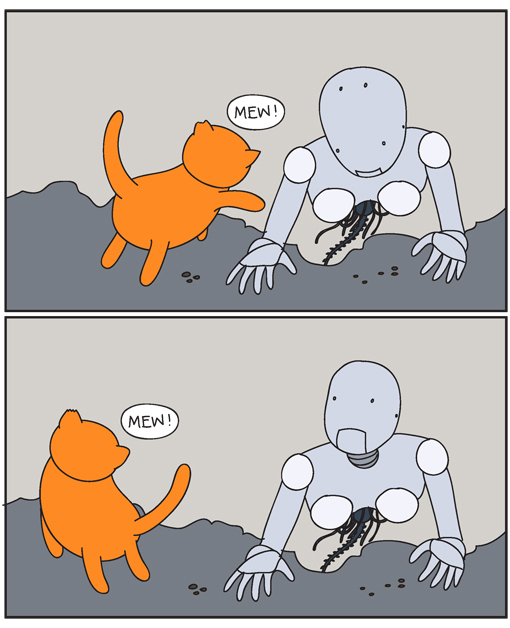 The story of poor little robot girl and her kitty. Awwww. 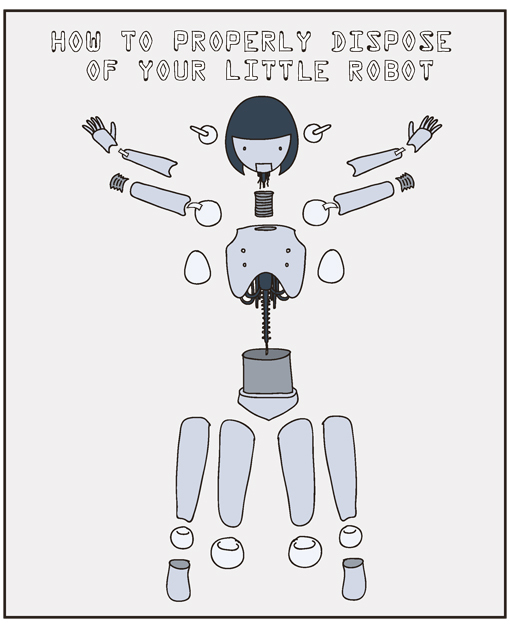 So sad to get rid of such a cute robot. This is the best one you have drawn. It actually has a story! This made me happy and sad at the same time. Thank you! Sadly sweet - this would make a beautiful animated short, too! 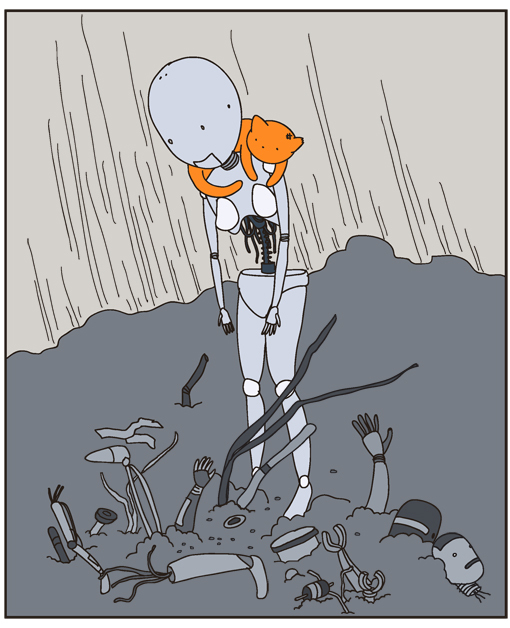 I'd love to see this little robot and her kitty friend's continued adventures together. Love! The setting reminded me of a really sad light novel I once read, "Iris on Rainy Days". Awesome comic, hoping for a continuation. It is so sad, but truth hurts sometimes. We discard things very easily and sometimes relations are thrown away too, way too fast. 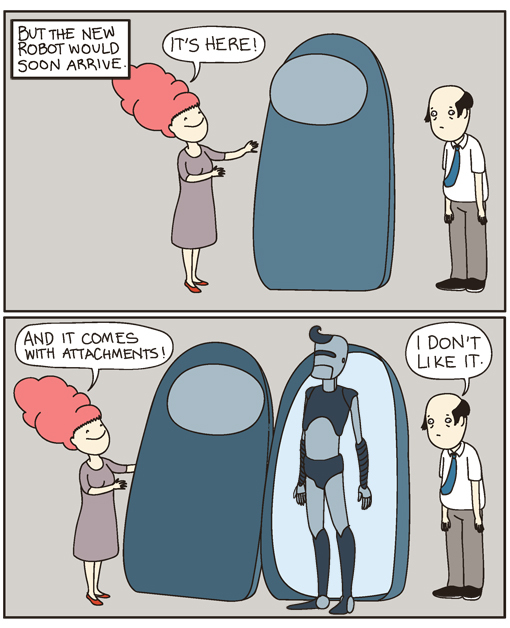 I wonder what "attachments" the male robot comes with, no wonder the husband didn't like it, LOL! 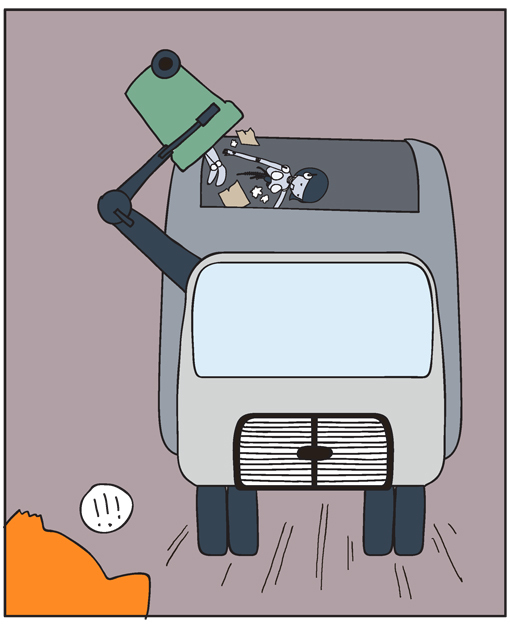 A wonderful little comic! This made me cry!!!! 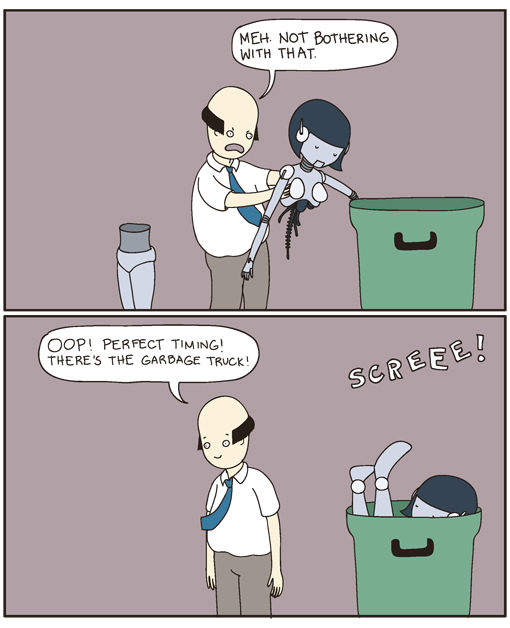 ;___________; poor little robot! Glad her kitty friend never gave up on her! Also, it is a sad commentary on that loveless home full of cold, uncaring humans where the only love a cat can get comes from a machine. Awwu! So cute! 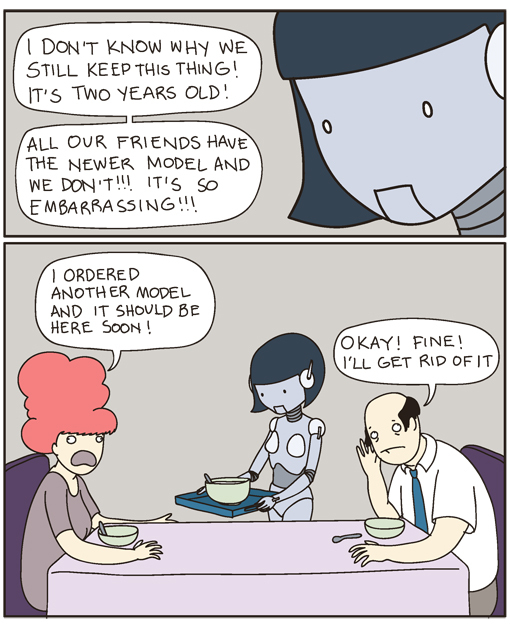 I think the only thing better would be if the robot looked even more human..but then you're getting into darker metaphors and such.. As it is, it's very simple to grasp and really activates some primal emotions; no one wants to be discarded just cos they're not young/good/active/whatever enough anymore. This was a lovely Saturday Morning surprise! Thank heavens for not following instructions! 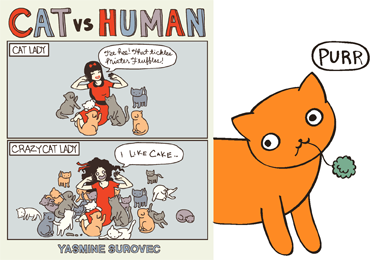 love your comics and this one is so sad and sweet and full of wisdom.thx. Fantastic! I'm left wanting more. 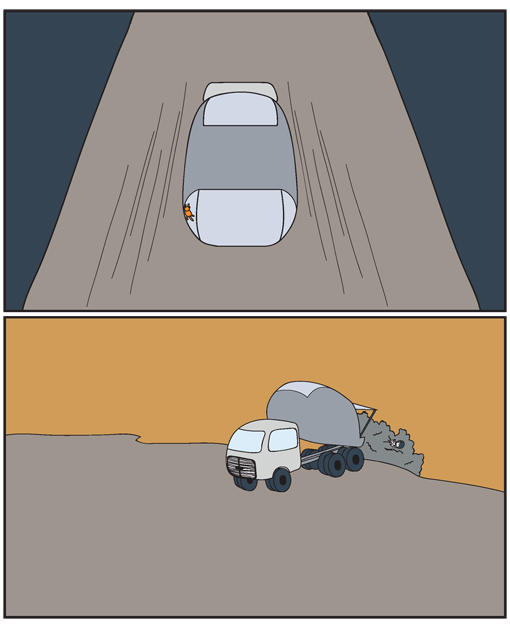 The more I think about this comic, the deeper it gets. Thank you. Thank you. Thank you. I love this so much, it almost makes my heart hurt. So sweet!!! Oh but I dont like the 2nd robot...I just love the 1st one..so sincere!! this reminds me of a book called "Beta"
That is so beautiful and touching. I admit it when I'm not being my stonehearted cynical self I'm a sentimental softie. This is perfect. 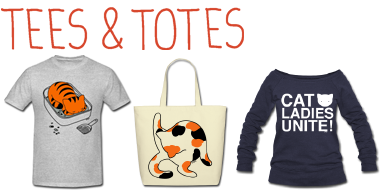 I'm a cat person and I do sci fi. I did a shortfilm about a robogirl https://vimeo.com/47990034 I've never done a story with both subjects. Thank you. 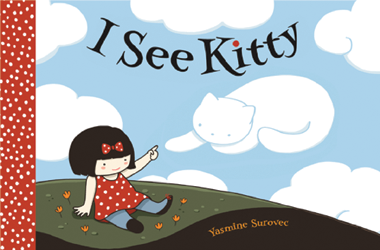 ∑:O Aw~ I love this story, meow! I am newly exposed to your comic / artwork. Definitely worth watching / reading once again. this is so sad. 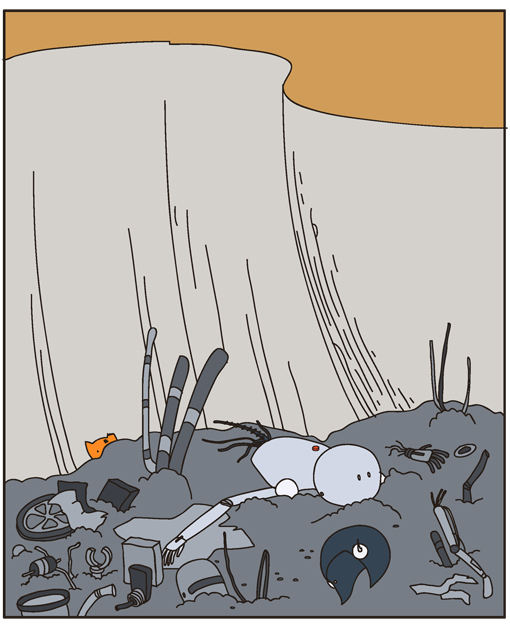 poor robot.. love the story! I love it! You should definitely make a sequel.